A new study from University of California, Berkeley, researchers demonstrates that adult stem cells can reshape our organs in response to changes in the body and the environment, a finding that could have implications for diabetes and obesity. Post-doc Lucy O’Brien explains how studying stem cells in fruit fly epithelial tissue – skin, glands and intestines, for example – can shed light on the role of adult stem cells in humans. Current thinking has been that, once embryonic stem cells mature into adult stem cells, they sit quietly in our tissues, replacing cells that die or are injured but doing little else. But in working with fruit flies, the researchers found that intestinal stem cells responded to increased food intake by producing more intestinal cells, expanding the size of the intestines as long as the food keeps flowing. “Because of the many similarities between the fruit fly and the human, the discovery may hold a key to understanding how human organs adapt to environmental change,” said David Bilder, UC-Berkeley associate professor of molecular and cell biology. The research will be published in the Oct. 28 issue of the journal Cell. Experiments such as this “could provide important insights into the therapeutic use of stem cells for treatment of different gastrointestinal and metabolic disorders such as diabetes,” wrote Abby Sarka and Konrad Hochedlinger of Harvard University in a Cell perspective accompanying the publication. Many tissues grow or shrink with usage, including muscle, liver and intestine. Human intestines, for example, regrow after portions have been surgically removed because of cancer or injury, and hibernating animals see their intestines shrink to one-third their normal size during winter. Following the surprising discovery of stem cells in the intestines of fruit flies five years ago, O’Brien and Bilder decided to investigate the role of adult stem cells in normal intestinal growth in hopes of finding clues to their role in vertebrates like us. “I looked at stained stem cells in the fruit fly intestine, and they are studded throughout like jewels. The tissues were so beautiful, I knew I had to study them,” O’Brien said. 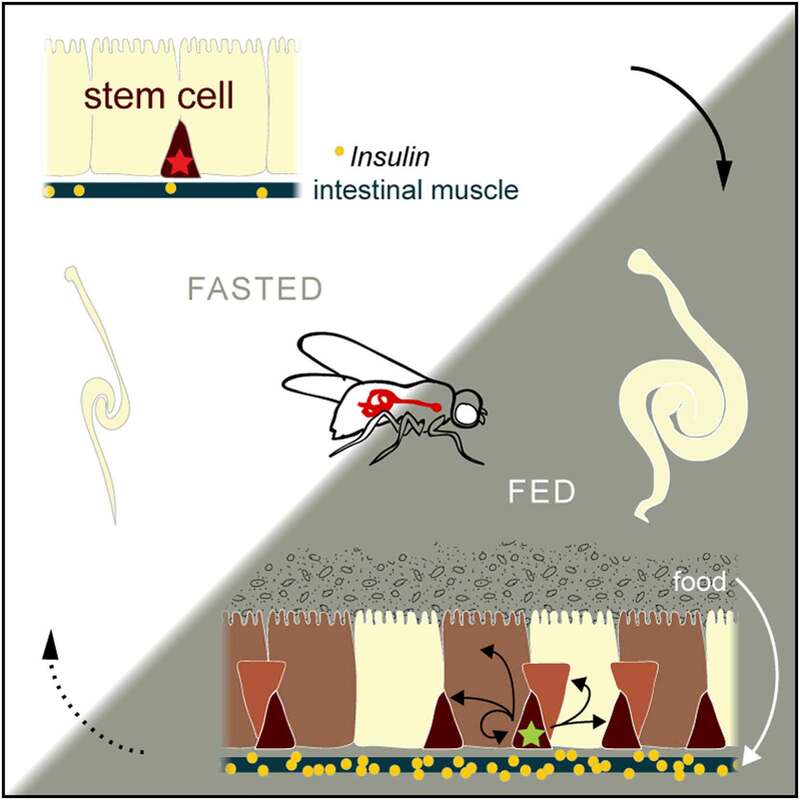 O’Brien, Bilder and their colleagues discovered that when fruit flies feed, their intestines secrete insulin locally, which stimulates intestinal stem cells to divide and produce more intestinal cells. After feeding, fruit fly intestines release insulin to kick stem cells (triangular cells) into overdrive to produce more intestinal cells (oblong cells) and more adult stem cells. Stem cells can divide either asymmetrically, producing one stem cell and one intestinal cell, or symmetrically, producing two stem cells. The team found that, in response to food, intestinal stem cells underwent symmetric division more frequently than asymmetric division, which had the effect of maintaining the proportion of stem cells to intestinal cells, and is a more efficient way of ramping up the total number of cells, O’Brien said. Bilder and O’Brien’s coauthors on the Cell paper are UC Berkeley staff researchers Sarah S. Soliman and Xinghua Li. The work was supported by the National Institutes of Health and, for O’Brien, by a Genentech Foundation Fellowship of the Life Sciences Research Foundation. My mother used to have double vision problems or sometimes blindness in one eye. We consulted with many doctors for this. There was no cure for this. She had been suffer for this for about two long years.I searched online a lot and took a risk. She has been taking multiple sclerosis treatment for last few months and till now her therapy is no going.But after taking few therapies, she is now doing really well now. Almost, 90 percent of her problem is now solved.